3. Gouging the Tone chamber. Mark center and 22 mm from center. Make black with a very soft pencil. Use your fingers to rub it in. 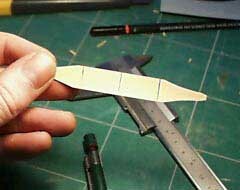 When gouging the tone chamber the pencil will show you when both tone chambers are equal. 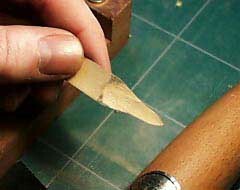 Gouge the tone chambers in three steps. 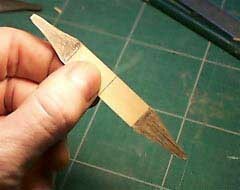 One long gouge from the 22 mm line, then one 1/3 from the 22 mm line and the last one from 2/3 from the 22 mm line. Gouge the shoulders away. 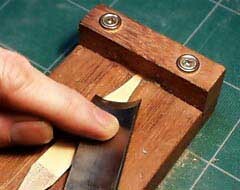 This will help the reed to bend nicely around the staple. When done it looks like this. Make sure both tails are identical. 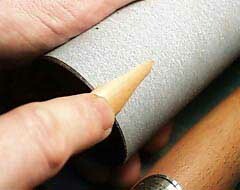 Sanding block ± 58 mm diameter. Just to smooth the chambers. 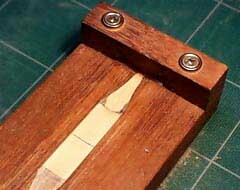 Here you can see the gouged tails from the side they are ± 0,7 - 1 mm thick along the center. 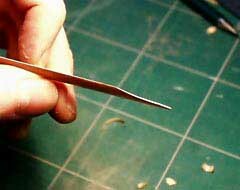 Besides the tuning aspects and easing the second octave this type of reed bends very easy around the staple thanks to the gouged chambers. 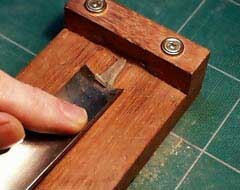 This is why they also reduce stress on the blades when tied to the staple. And that why you can use such a large diameter sanding block.